I absolutely loved everything about the unit. The biggest asset was the view! I was pleasantly surprised with the view I had from the living room, as I hadn't realized from the photos online that it had one...I thought the view was only from the deck. Ocean Harbor is a large complex, but, this unit is the one closest to the beach, and better yet it faces north so that you don't get the harsh sun blaring in during the day. Although within the complex itself there are a lot of stairs to maneuver, this unit is close to the parking stalls, and on the first floor, so the only stairs are a set of maybe 7 leading up to the complex, and then 2 down to the door. It is something to consider with unloading the car. The laundry room is also very close, although it has a longgg set of stairs down to the laundry room. The laundry room uses a card, not coins. Be sure to ask about that. Not far from the laundry room are the trash cans set behind a set of gates. The complex also has an area with a hose to wash your car. Very helpful as the sand and seagulls make a mess of the car on a daily basis. But the absolute best thing about the complex is that you can walk out your door, walk 200 feet out of the complex, and you are on the beach. There are firepits to have bonfires at night. If you don't want to walk down to the beach, there is a walking trail. If I had any criticism at all it would be that the unit is definitely not big enough for more than one person or a couple that sleeps in the same bed. Although it says that it has a sofa sleeper, it is so uncomfortable it is like laying directly on metal coils and it's small. Furthermore, when it's open there is absolutely no room to move. So, having an overnight guest is difficult at best and would have to bring a blow up bed. My daughter and sister came down for the blues festival and had to get a hotel room. Finally, I have to say that Michelle at Monterey Rentals is sheer joy to work with! Watch the surf on Del Monte Beach from the deck of this cozy, compact condo with an amazing ocean view. Don't be surprised if you see sea lions, otters, or dolphins swim by! (And with laminate floors throughout, sandy feet are no problem.) There's a table for two just off the kitchen and seating for four at the breakfast bar. The kitchen has granite counter tops and new cabinetry and is equipped with an electric range, microwave, refrigerator, dishwasher, and disposal. The living room has cable TV/DVD/VCR/Stereo, the bedroom has a Queen bed, and the bath features a large shower with a separate vanity with granite countertop. You will enjoy the outdoor spaces at this property as well as the indoor spaces: you're steps from the sand, and the front deck is the perfect place to barbeque while you enjoy the ocean view. Ocean Harbor House offers a weight room, two hot tubs, his and hers dry saunas, and two recreation rooms with pool table and ping pong table. The laundry room is located on the premises and close to the unit. This property is located within walking distance of Fisherman’s Wharf, the Naval Post Graduate School, and downtown Monterey. Everything was much nicer this year... no complaints. The owner might consider getting very small nighttables in bedroom.... I had no problems that needed fixing. Had a excellent stay at Ocean Harbour 108. The bed was perfectly big and comfy. Happy about the wooden floor. Located direct at ocean front was fantastic. Rare to find compared to the price. Loundry so close to the appartement was great. Own parking spot made it very easy for food transportation. Service of Montereyrentals perfect. Had fast replys and everything worked perfect. Always again. Looking forward to the next stay. The appartment is very nice and ideal for young couples. The kitchen is well furnished even if the fridge is too noisy. It was a pleasant stay and the view is great. Only defect: I don't like carpets because it is difficult to clean well the appartment and the carpets themselves. We’re glad to hear your enjoyed your stay and are sorry to hear the refrigerator made excessive noise (we’re looking into it). Perhaps the next time you visit, we can help you find a property with hardwood floors instead of carpet. Just check the listings for information on floor coverings, or ask an agent to assist you. Charming unit, right on the water! 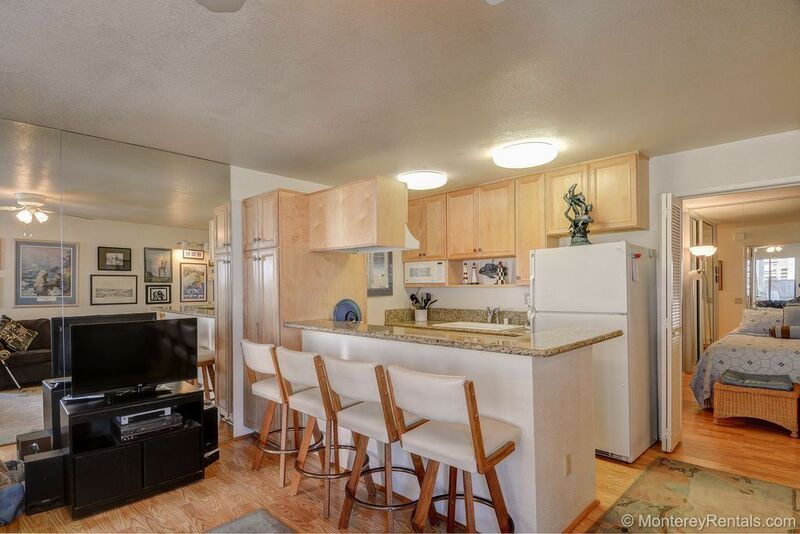 This compact but well stocked little unit is a wonderful place for a relaxing vacation or a work trip in Monterey. It fits two people, but if you have guests, be prepared to step over them, lol! Everything you need is included, and it is especially helpful to have kitchen staples in the cupboard.The location is unbeatable. You are right on the water's edge. It is a 30 minute stroll up the beach to the wharf area. I enjoyed walking up to Loulou's for breakfast, the London Underground for dinner, and the wharves for afternoon browsing. The team at Monterey Rentals are excellent to work with. They even sped around to let me in when I locked myself out! Great stay. Can I come back? Ashley and Michelle, the mother and daughter team at Monterey Rentals, were warm and welcoming. They personally assisted me in selecting the appropriate rental property for my needs. The set-up was exactly what I was looking for. I was hard-pressed to find anything missing that I may have needed. Even kitchen cooking spices and storage containers were provided. One of the best parts about the unit is the ocean view from the living area/deck; you can hear the waves all the time. There is a good heating system in the unit, which was useful as winter appoached. If needed, the shower is out-fitted with seats and holding bars for stabilization. When entering the parking lot, I entered the code everytime as I didn't have a gate clicker. Trash is downstairs to the left of the laundry. This is down a separate, longer flight of stairs (different from the parking spot). There is a laundry key card in the unit which you will need to add money to by using the card machine in the gym (located upstairs toward the center of the building complex). The neighbors were quiet yet friendly. People are happy to be living/staying right on the water. I would definitely stay here again. I absolutely loved everything about the unit. The biggest asset was the view! I was pleasantly surprised with the view I had from the living room, as I hadn't realized from the photos online that it had one...I thought the view was only from the deck. Ocean Harbor is a large complex, but, this unit is the one closest to the beach, and better yet it faces north so that you don't get the harsh sun blaring in during the day. Although within the complex itself there are a lot of stairs to maneuver, this unit is close to the parking stalls, and on the first floor, so the only stairs are a set of maybe 7 leading up to the complex, and then 2 down to the door. It is something to consider with unloading the car. The laundry room is also very close, although it has a longgg set of stairs down to the laundry room. The laundry room uses a card, not coins. Be sure to ask about that. Not far from the laundry room are the trash cans set behind a set of gates. The complex also has an area with a hose to wash your car. Very helpful as the sand and seagulls make a mess of the car on a daily basis. But the absolute best thing about the complex is that you can walk out your door, walk 200 feet out of the complex, and you are on the beach. There are firepits to have bonfires at night. If you don't want to walk down to the beach, there is a walking trail.If I had any criticism at all it would be that the unit is definitely not big enough for more than one person or a couple that sleeps in the same bed. Although it says that it has a sofa sleeper, it is so uncomfortable it is like laying directly on metal coils and it's small. Furthermore, when it's open there is absolutely no room to move. So, having an overnight guest is difficult at best and would have to bring a blow up bed. My daughter and sister came down for the blues festival and had to get a hotel room. Finally, I have to say that Michelle at Monterey Rentals is sheer joy to work with!